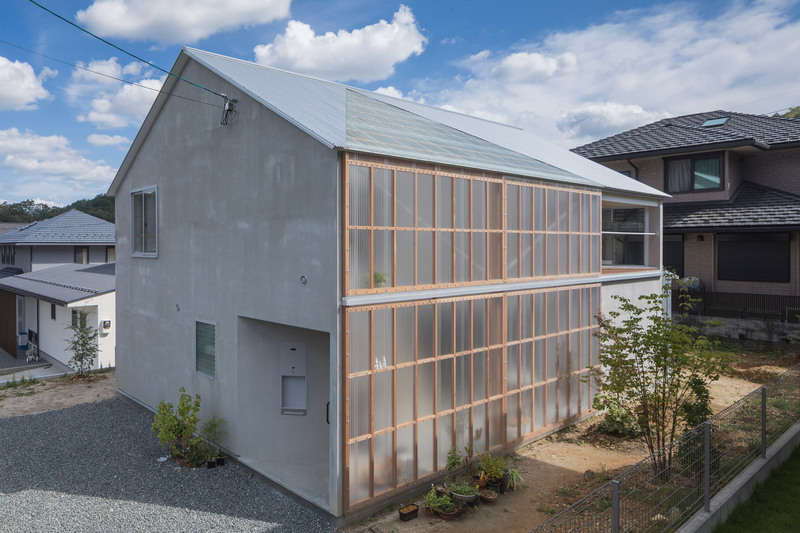 Japanese studio Tato Architects has built a house in the town of Sonobe, Japan, with a sunroom that can be opened up to the garden by sliding open a huge corrugated polycarbonate wall. 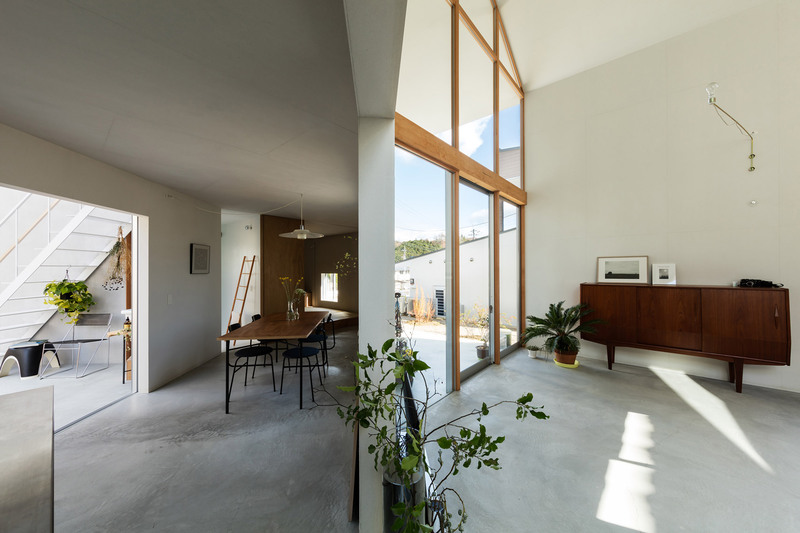 The Kobe-based studio headed by architect Yo Shimada designed the building for a plot within a recently developed residential area in the mountainous Funai district. 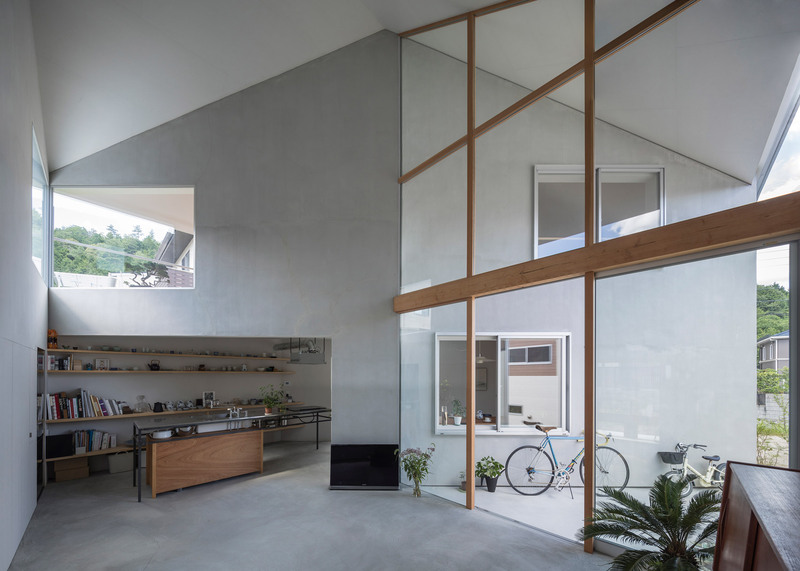 Shimada, who designed a property in Osaka featuring layered platforms without any internal walls that picked up the Dezeen Award for House of the Year 2018, took inspiration for House in Sonobe from ad-hoc additions to local homes. 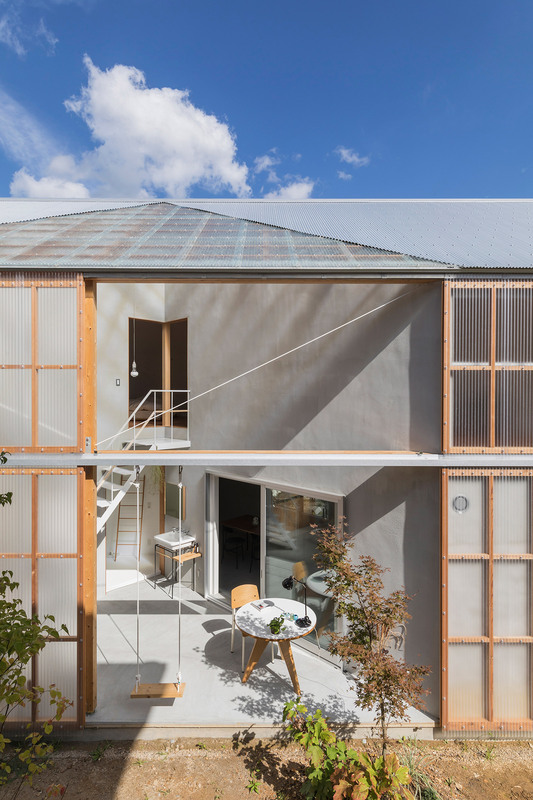 The region’s cool and wet climate encourages homeowners to erect lean-to extensions clad with corrugated polycarbonate panels that provide them with warm and dry sunrooms. 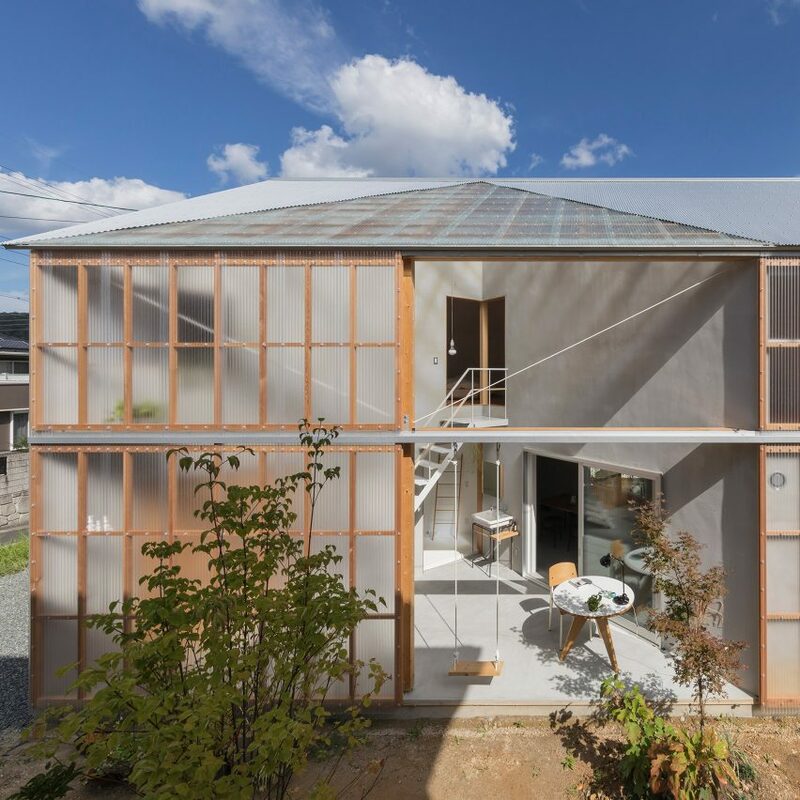 “These so-called ‘terrace enclosures’ are often used as storehouses in winter, or as places for drying laundry – a clever feature, that we realised represents a certain style shared among the various new mass-produced houses of this residential district,” Shimada pointed out. The architect added that these extensions informed the materials and functionality of the sunroom his studio included in its plan for the house, which also features a variety of other open-air spaces. The building’s floor plan is arranged as a square grid, with internal walls positioned at 45 degrees to the main elevations used to divide the interior into different functional zones. The angled partitions create a variety of spaces around the perimeter of the building that are either open to the elements or can be connected with outside if required. 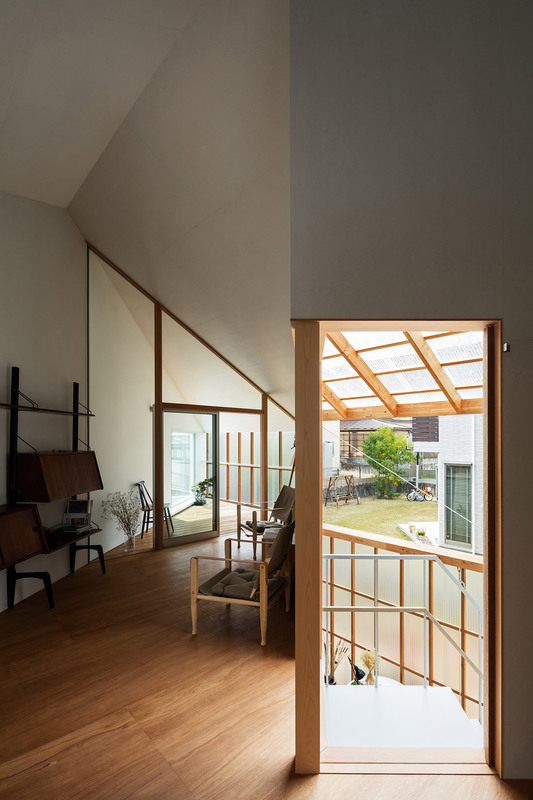 A sunroom on the west side of the house is enclosed by a large suspended wall that can slide across to transform the room into an open-air courtyard connected to the garden. Moving the wall also allows a veranda beneath the eaves on the upper floor to become an additional interior space connected to the master bedroom. Another triangular void on the opposite side from the sunroom provides a more intimate terrace lined with double-height glazing that allows daylight to flood into the adjacent living area. In addition to the open-plan living space and outdoor areas, the ground floor accommodates a bathroom and a Japanese-style guest room with tatami flooring. Angled walls at one corner of the house enclose an entrance porch and a compact storage space. A staircase with open metal treads extends up one side of the sunroom to the bedroom housed beneath the pitched roof. Shimada is known for his imaginative approach to residential architecture. His studio’s previous projects have included a house comprising a stack of offset horizontal boxes, and a refurbished property where the internal walls are replaced with curving plywood screens. Photography is by Shinkenchiku Sha unless stated otherwise. 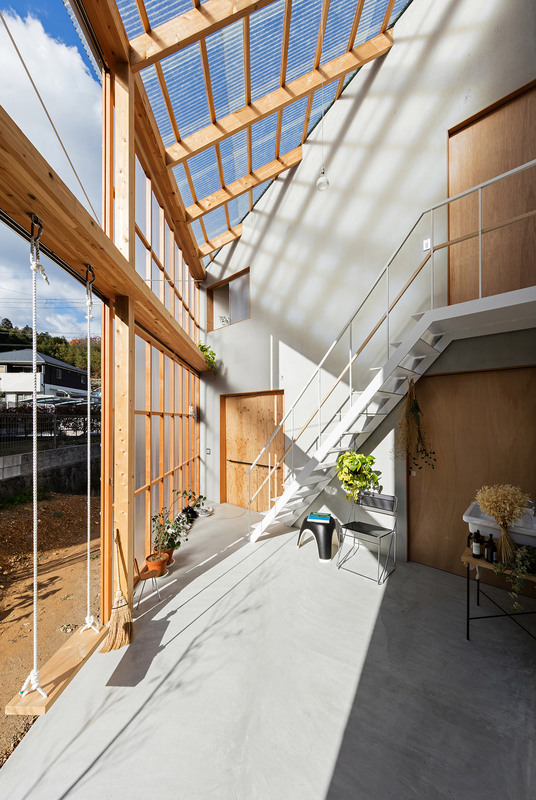 The post Huge sliding door reveals courtyard at House in Sonobe by Tato Architects appeared first on Dezeen.